I’ve been wanting to create a “command center” in my kitchen for a while now. I imagined that this area would share fun messages and be magnetic so that we could pin up photos, notes, bills etc. 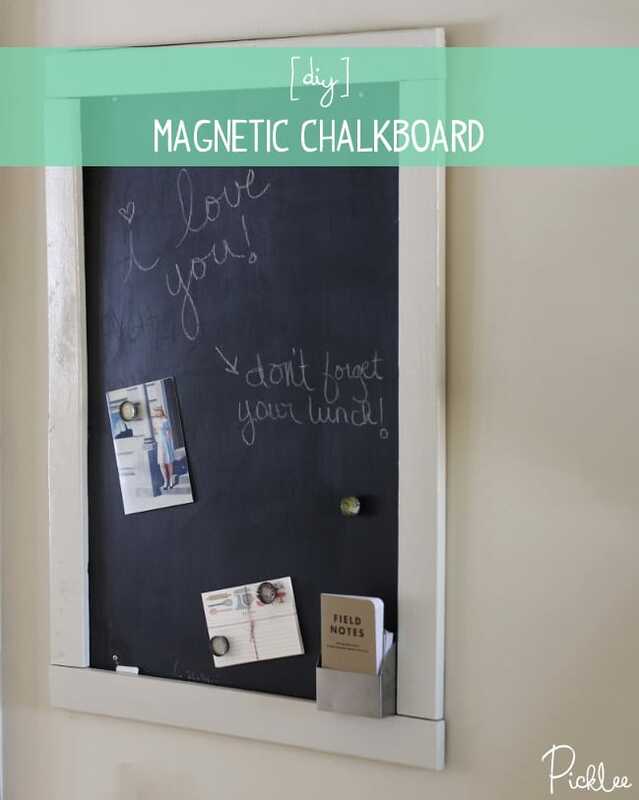 I’ve had plenty of experience creating DIY chalk boards, but none of them had ever been magnetic…So since chalk paint is capable of covering just about any surface (wood, metals, plastics etc. ), I set out to find a magnetic (and paintable) surface for my chalk board. 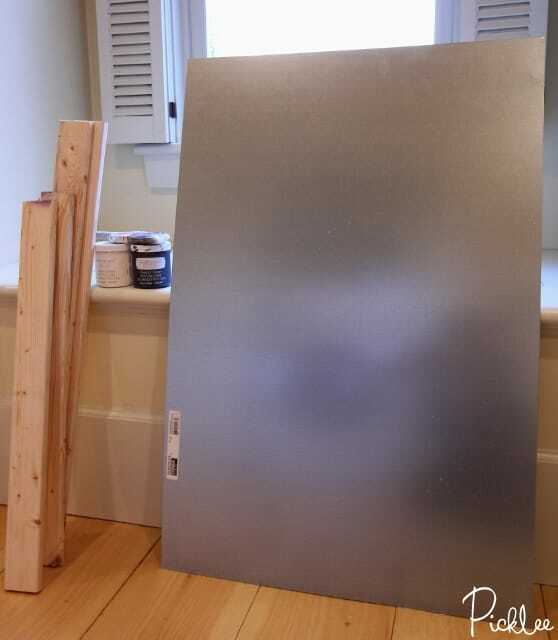 While browsing my local Home Depot it occurred to me that sheet metal, which is made up of mostly aluminum & tin, would make a perfect chalk board surface! Lay down a drop cloth to protect your floors (hubby almost killed me when he first caught me painting without one!) 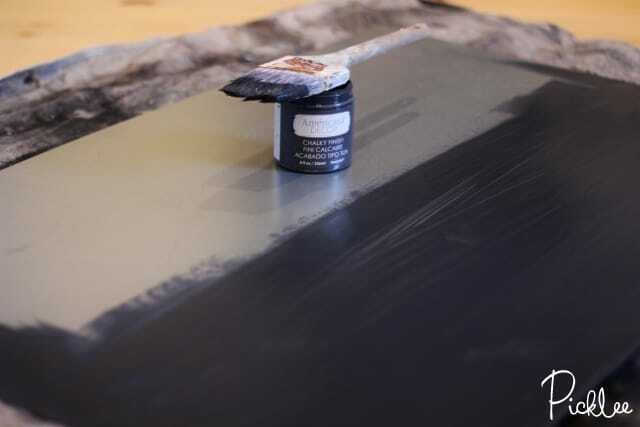 Apply two coats of black chalky finish paint to the sheet metal, waiting an hour between coats. 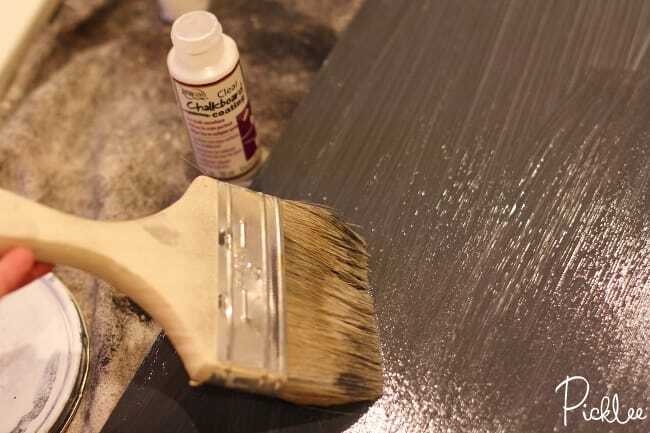 While the chalky finish paint is drying on your sheet metal, start working on the chalk board’s trim. I was able to snag pieces of fir strapping for next to nothing, thanks to a bargain wood bin at my Home Depot! Then luckily, the nice fellows there helped by cutting the pieces to size to size for me (they usually will if they aren’t super busy =) ). 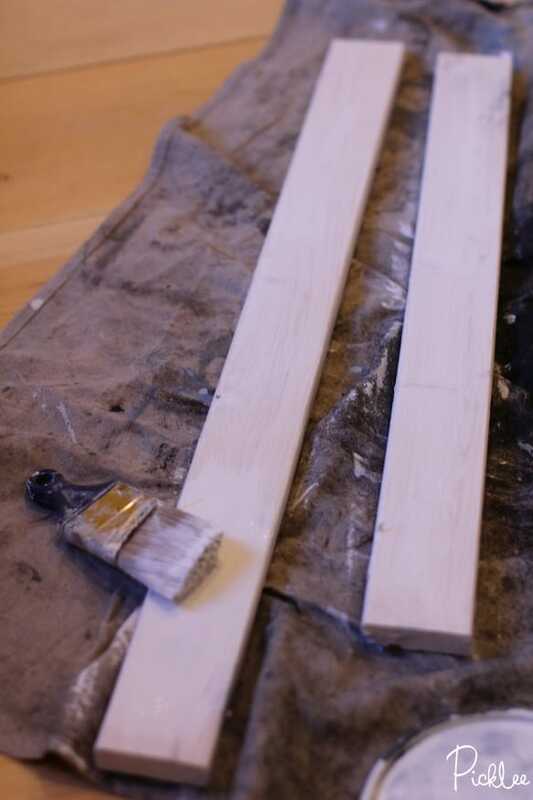 Apply a coat of primer to the raw wood, let dry for about an hour. 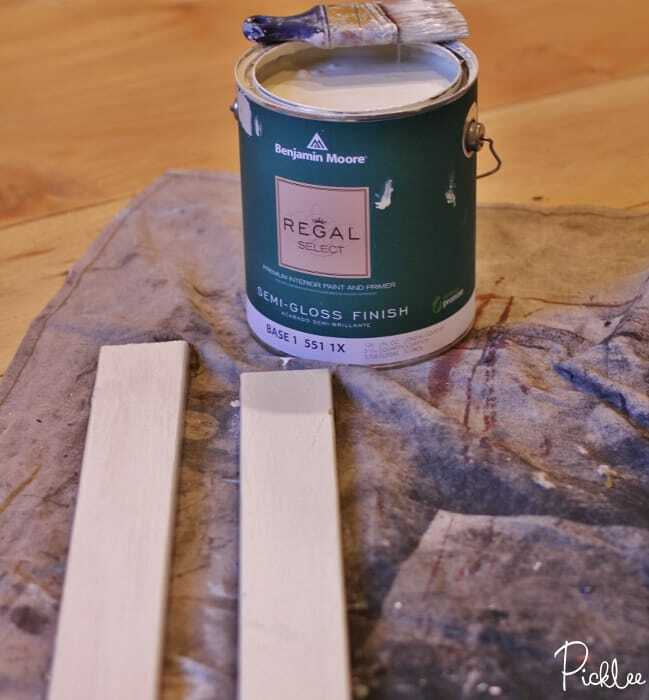 Once the primer is dry, apply two coats of your finish paint, waiting an hour between coats. 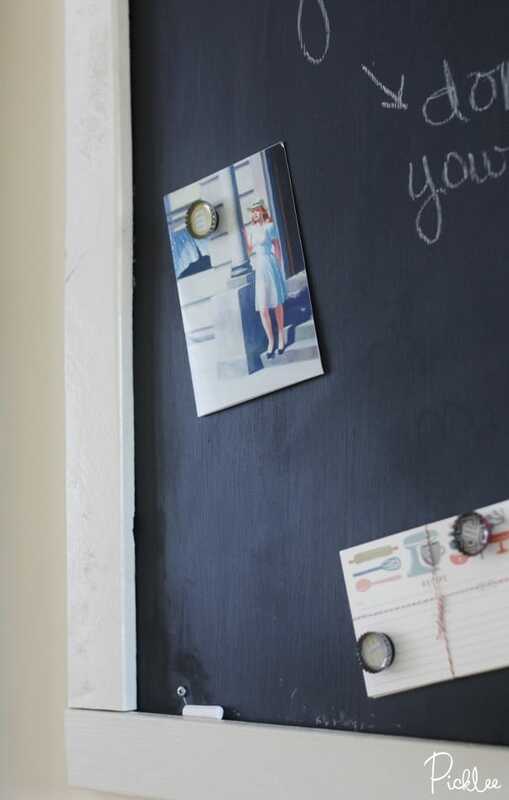 Once the chalky finish paint has dried, you’ll need to apply a protective finish to your magnetic chalk board. 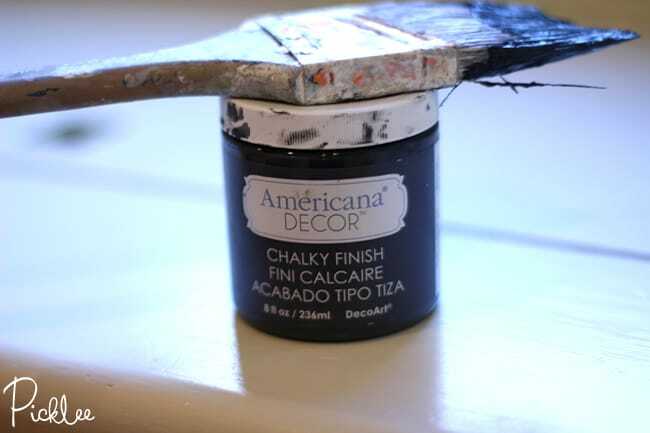 Sometimes you can seal a chalk board by simply “seasoning” it with chalk (rubbing chalk over the dry paint, then buffing it in with a cloth), but Deco Art makes a great product for sealing a heavy use chalk board. I applied a thin coat of the clear Chalkboard Coating to my magnetic chalk board. I really liked working with this sealer because it dried super fast and very matte (not shiny at all). After the sealer has dried, your ready to hand your chalk board! Hubby came in handy for this part =) We mounted our magnetic chalk board using sheet metal screws (available at any hardware store). I held the chalkboard in place while he drilled four screws into it (one screw in each corner). 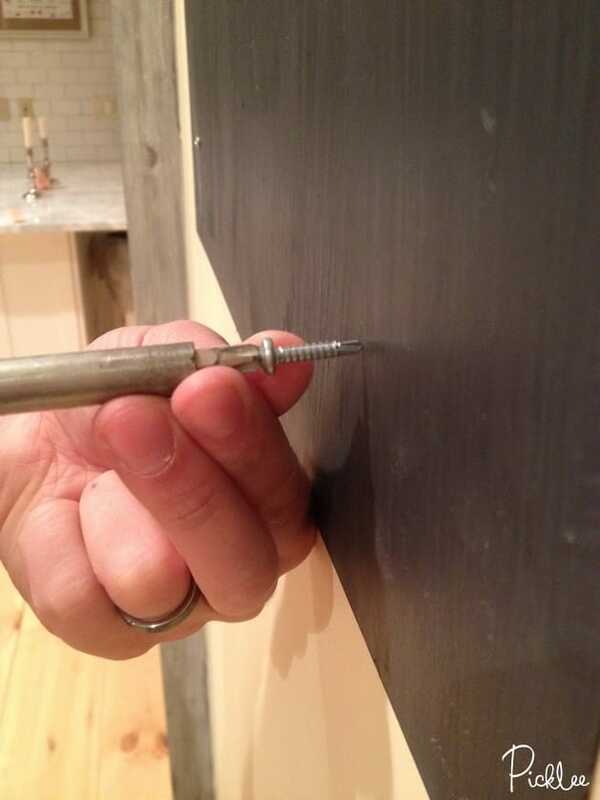 Since we created a smaller sized magnetic chalk board, we simply made sure that the board screwed into at least one stud (by using a stud finder). However, if you are creating a very large board, I’d suggest using an adhesive (such as Liquid Nails) along with more screws. 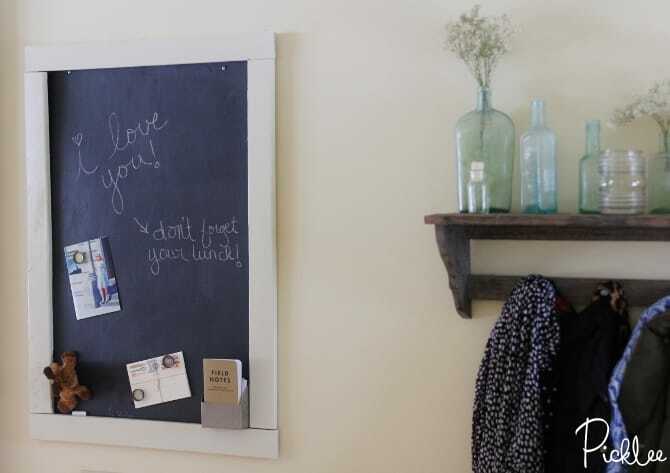 Now that your magnetic chalk board is nice and secure in it’s new home, you can apply the chalkboard’s trim! I secured my trim directly to my chalkboard using hot glue. It’s important to note that I did not apply the hot glue to the wall, simply to the outer edges of the chalkboard. You can use a nail gun to shoot the trim into the wall too, if there are edges that hang over beyond the sheet metal. That’s all folks! The entire magnetic chalk board project took me less than 3 hours on a Saturday afternoon, and man did it make an amazing impact it made in my kitchen! 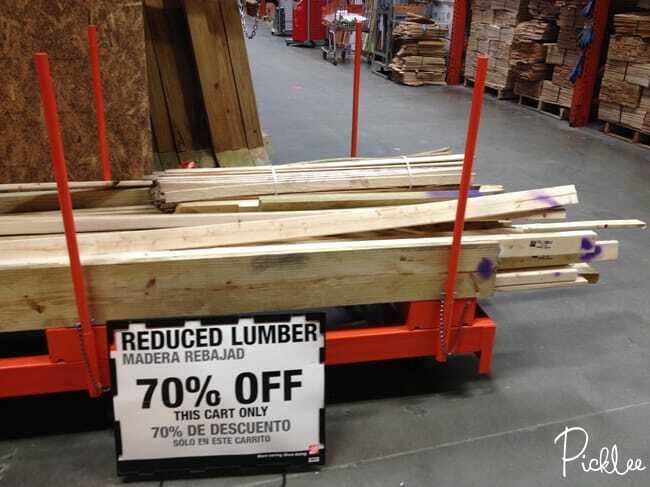 Looking for more home improvement projects? Find them here! Yay! Really enjoy your posts, and wanted to give you the heads up! I catch myself too! Thank you for this inspiration. I have been mulling painting our beat up (but functioning) refrigerator for awhile. Intimidated with all the chalk paints out there. Now, I may tackle this as soon as all this ice & snow leaves for good! BTW — is that well-displayed ‘Field Notes’ a Solid Sound Festival 2013 guide ? Hi! 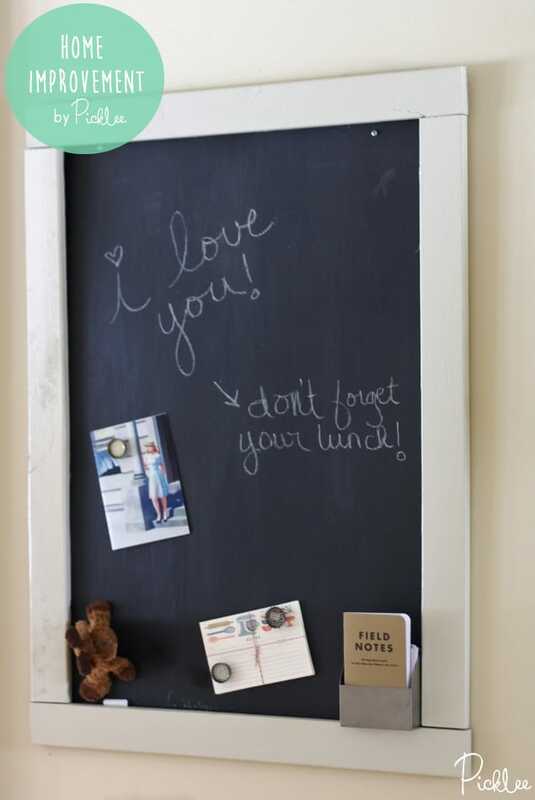 I plan to make one of these for my boyfriend (using pictures on the boarder) and was wondering, have you tried chalk markers? If so, did they work well despite the top coat? Also, have you had any problems with the metal rusting? 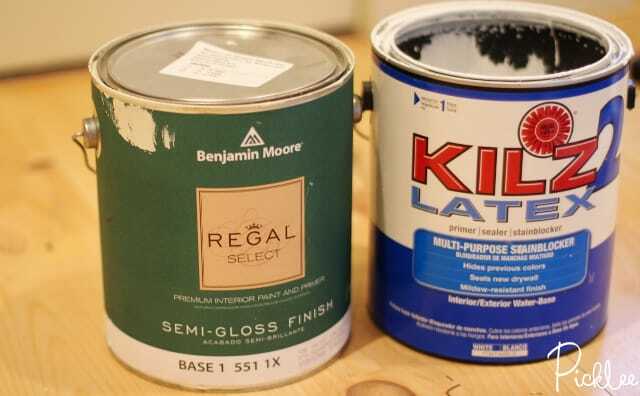 (I’ve read to use a rustproof primer but am wondering if that will impact the chalkboard paint adhesion). THANKS! I used this helpful post to make a chalkboard that from the galvanized sheet metal, but it was laid in a regular frame from the thrift store. Home depot suggested I use a spray primer on the metal, then did 4 coats of the chalkboard paint allowing dry time of one hour between each coat. The primer did not cause issues with having the chalkboard paint adhere. I also have a question about the chalk ink markers. I am afraid to do a test on my new board since it will be a gift, but wanted to include the markers. Love what you’ve done! 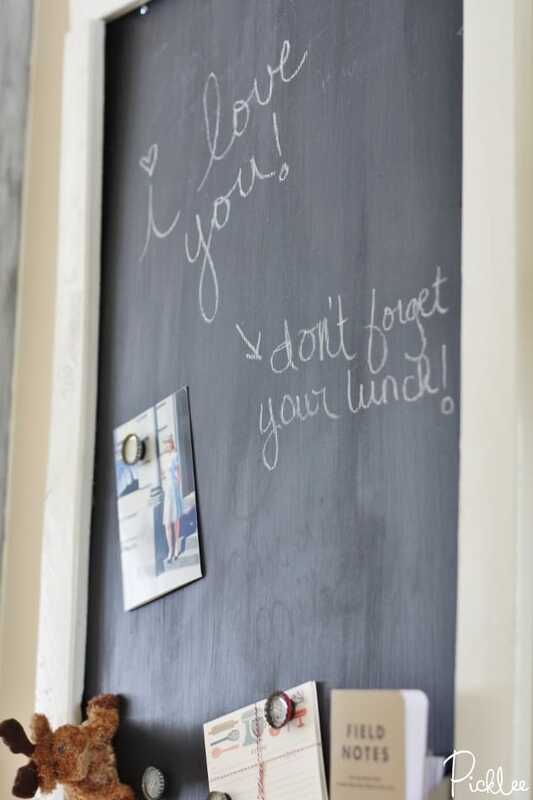 I plan to do this for our new kitchen as a place to write reminders and have my kids put up their artwork. Just wondering… you had no issue with the paint sticking to the sheet metal? I’ve seem similar posts saying they needed to sandpaper first before painting so I’m nervous about the best approach. I’m not super handy so want to make sure I plan this out right! Thanks again for sharing. I am looking to make a magnetic spice rack, on the wall…behind the stove. Do you think sheet metal will work for this? I found some magnetic bottomed tin in 2 oz sizes to use. Ideas or suggestions? Can you share the dimensions of the wood fir frame pieces you used please? The whole frame was approx. 40″ X 32″…then the pieces used were approx. 3″ wide. Hello. I was wondering about the sanding as well i guess in your case there was no need bc ur bought a new piece of metal. I’m planning on painting a filing cabinet with chalkboard paint, so i can assume the filing cabinet will still be magnet when i cover the item. Also you are the only person whose tutorial included a sealer. Can u tell me which brand and type you used.